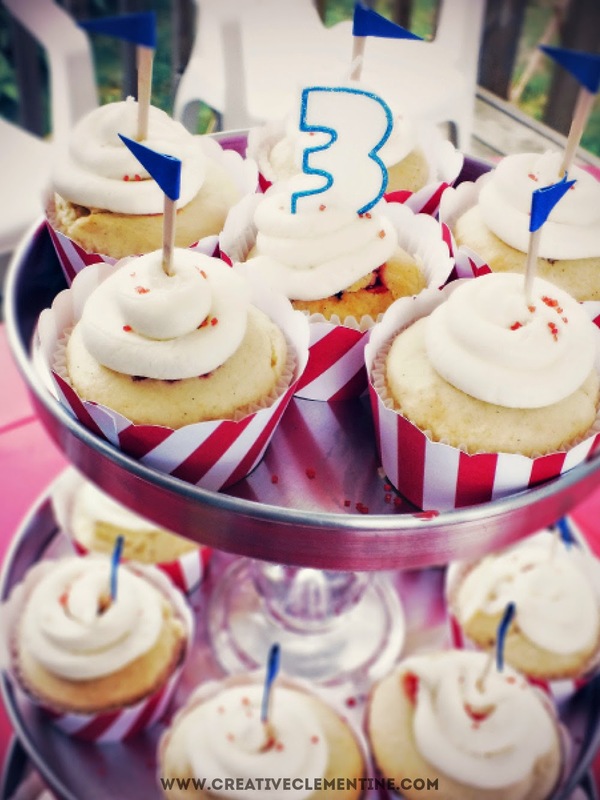 My nephew's second birthday party was one of the first elaborate parties I helped plan, and was one of the parties that inspired me to start Clementine up in the first place. It's hard to believe that he is turning six this year, and that I haven't blogged a single party of his since the first one! For shame. For my nephew's third birthday, his mom and I decided to go for something a little more social. He had been in daycare for a little while, and had made a few new friends we wanted to welcome. 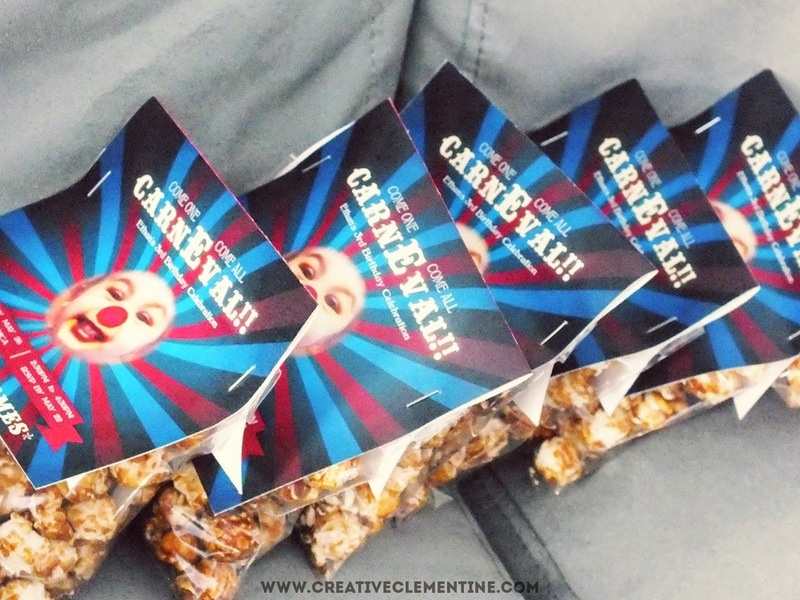 A carnival theme was a no brainer! *Ahem* ...My main priority for this party was the food. Surprised? 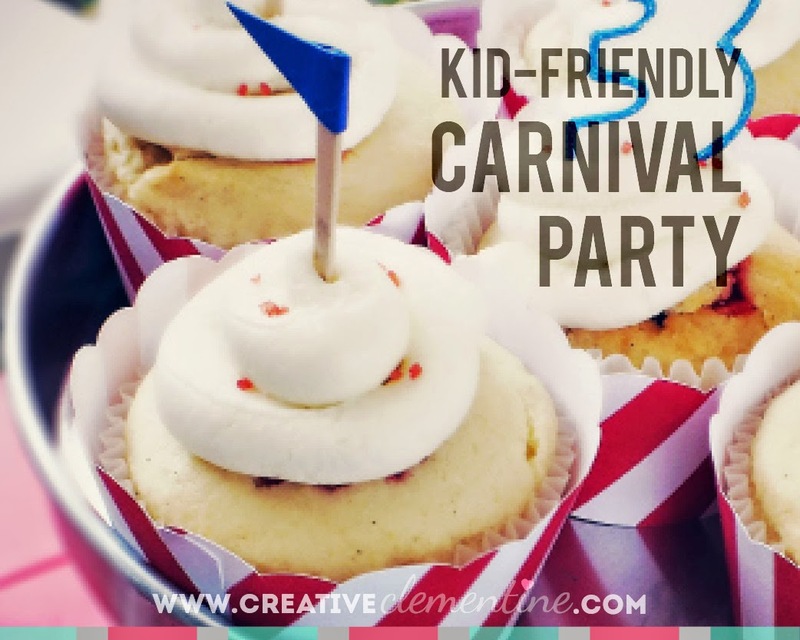 Not serving carnival-appropriate food at a carnival themed party is just... well, it defeats the purpose of having a carnival theme party at all, if you ask me. And besides that, my sister is really good at entertaining people. I'm good at feeding them. It was a built-in division of labour/priorities. 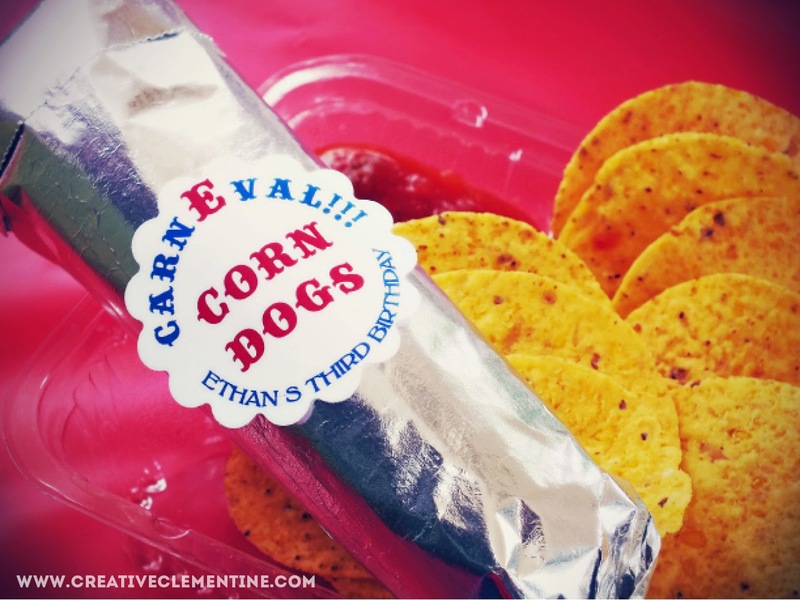 In the interest of boycotting the sugar-highs associated with the three main carnival sweets (candy apples, cotton candy, and snow cones), we opted for three menu items that we never miss out on when there's a carnival in our neck of the woods: Corndogs, Nachos, and Fresh Lemonade. The lemonade was the good stuff. Real lemons sliced up and mashed around in a jar with some sugar and water. As you can see from the pictures, the guests were drinking it faster than we could make it! The bottled water was the less fun backup plan for when we ran out of lemons... which we did, eventually. Sad, lonely water. And of course, no birthday is complete without cake! At the request of the birthday boy, I made vanilla cupcakes with cherry filling. He has good taste, that boy. We would never miss such an important detail! 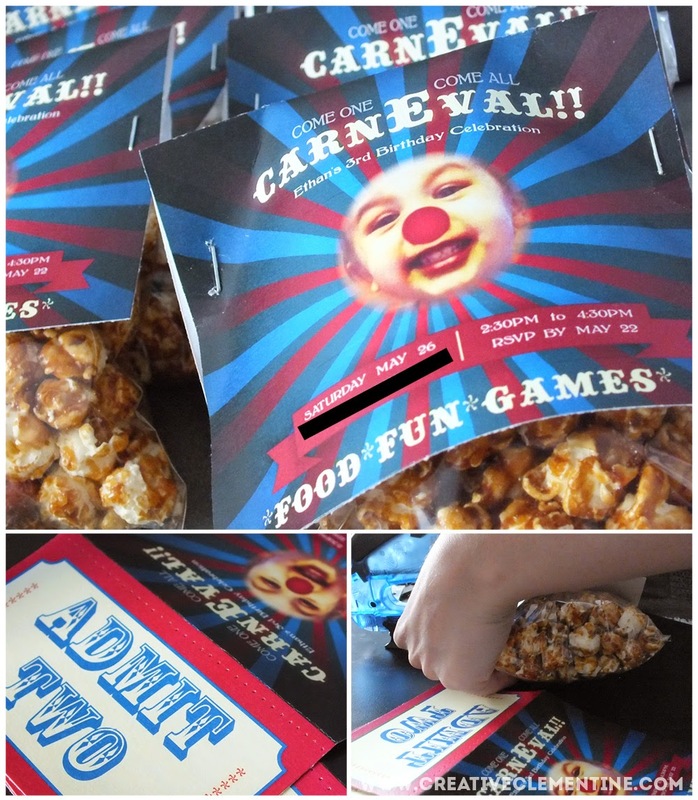 For the party invitation, we handed out little individual packages of caramel corn. The label itself had a tearaway admission coupon on the back of it. All in all, it was a fun day filled with face painting, salty snacks, games and prizes. Pretty authentic, if I do say so myself. I have a serious weak spot for Carnivals! Am I alone in this?! I'd love to hear all about your favourite Carnival snacks/adventures in the comments! oh my goodness this is so cute! I love the clown faces on the labels!! super adorable! Thanks for linking up last week at Totally Terrific Tuesday! I cant wait to see what you bring this week! Pinned and shared!